Last August, Greenwood resident Dorothy Tennefoss had resigned from her job to care for her husband Joe. She feared he would die before Christmas. His neck was swollen with cancer and he had become so ill from lymphoma that he didn’t have the strength to walk. With no medical insurance, the couple, both in their early 60s, had agreed that they would not take on a huge medical debt to pass onto their children. That decision meant that Joe, resigned to his illness, wasn’t seeking the medical care he needed. But when Dorothy found a lump on her breast a few months later, life took an unexpected and welcomed turn. 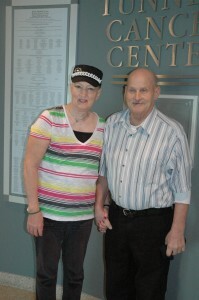 Dorothy’s connection in December with Debbie Campbell, RN, Beebe Medical Center’s cancer screening nurse navigator, changed the course of the lives of Joe and Dorothy Tennefoss. Not only did Dorothy initially get her first exam and mammogram paid for through the grant-funded Sharing our Story, Saving our Sisters (SOS2) program that Tunnell administers, but Debbie was able to get both Joe and Dorothy signed up for Medicaid, which is paying for their treatments. Kathy Cook, MSN, RN, nurse navigator at the Beebe Breast Health Center, also met with Dorothy and continues to guide her through her treatment process. Dorothy was diagnosed with a stage II breast cancer. Lewes surgeon Clara Higgins, DO, performed a biopsy and later a mastectomy on Dorothy. Dr. Higgins also performed a biopsy on Joe. Within a short period of time, and with financial help through Medicaid, both of them began chemotherapy treatments at Tunnell Cancer Center. Medical oncologist Srihari Peri, MD, Medical Director of Medical Oncology Services at Tunnell Cancer Center, gave an optimistic prognosis for Joe, who by the end of February had regained 25 pounds and was able to walk with no problem. Dr. Peri recently said that Joe’s tumors already had shrunk 80%. Because Dorothy’s breast cancer was caught so early, she also has a good prognosis. SOS2 is offering its monthly Breast Health Clinic with free mammograms for those who qualify on Thursday, March 14, from 5 p.m. to 7:30 pm at Tunnell Cancer Center on Route 24 in Rehoboth Beach. Pre-registration is required. To register, please call (302) 645-3169. Free transportation can be arranged to and from the screening site. This breast health program is funded with a grant from the Philadelphia Affiliate of the Susan G. Komen for the Cure. Breast Health Clinics are held on the second Thursday of every other month at Tunnell Cancer Center for those who do not have insurance, who are underinsured, or who cannot afford to pay. Women should begin clinical breast exams every three years starting at age 20, then every year starting at age 40. All women should have annual mammograms beginning at age 40. Beebe Medical Center established Tunnell Cancer Center in 1995. It has received the Commission on Cancer's highest accreditation with commendation as a comprehensive community cancer center. Its clinical specialties are medical oncology/hematology and radiation oncology. It also offers a multidisciplinary approach for planning all cancer treatment. Nearly 300 patients visit the center each day.